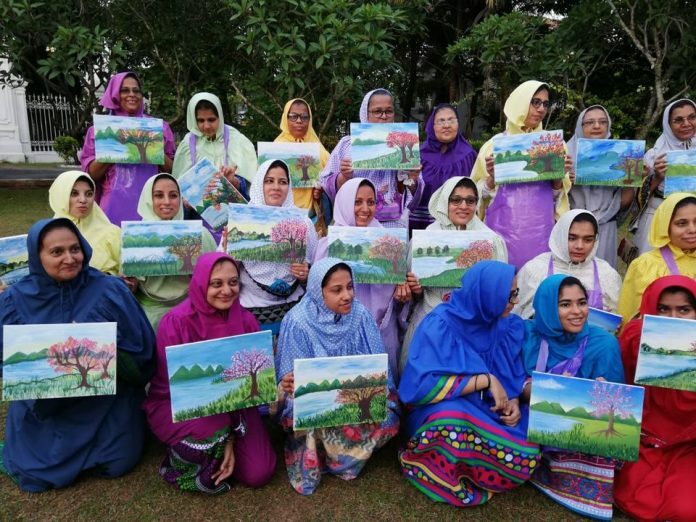 This year, the women’s organization Talebaat-il-Mumenaat (Colombo) had their annual Eid gathering on 23rd June in the form of a pop-up painting workshop aptly called Strokes ‘n’ Shade. The event was attended by both members and non-members of the organization. Amidst the beautiful garden of a colonial mansion situated in the heart of the city, the concept was to allow people to express themselves through paint; and to get in touch with their inner artist. “At first I was a bit worried as I don’t remember the last time I held a brush! However, as the workshop went on, I began to relax, immersing myself in the painting”, said Mrs. Jamila Zainuddin, one of the participants. Guided by artist and art educator Vydarshini Rajan, approximately 50 ladies (of varying age groups) were provided with canvases, acrylic paints, paint brushes and aprons in order to paint a predetermined landscape/ scenery. Different brush strokes and techniques were demonstrated by the instructor, along with knowledge on colour-mixing, shading and gradients. Despite everyone attempting to recreate a similar painting; as intended, each person’s canvas had a touch of individuality and their own imagination. The event was a ‘paint-astic’ success and the organizers are proud to have been able to bring out the true colours in all the participants.